One of the biggest reasons to buy a convertible crib is sleeping children make happy parents. Yet that’s not the only thing that makes them a worthy purchase. 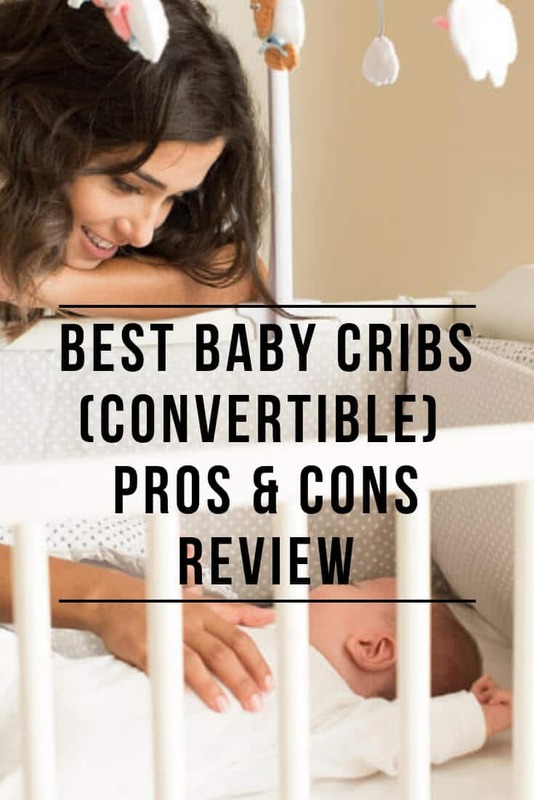 Why Buy a Convertible Crib – Is a Convertible Crib Worth It? A convertible crib is not only a time-saver, but a money-saver too. They transform from cribs to toddler beds to daybeds to full-size beds (like the Transformer toys, they’re more than meets the eye!). This allows your child to use their crib until they head off to college (though, hopefully, it won’t still be in crib mode). Convertible cribs also provide safety and peace of mind. With traditional cribs, babies tend to climb out as soon as they’re able. It might be good cardio, but it’s also dangerous. A convertible crib is a safer option, which allows moms and dads a more restful night sleep. As soon as the crawling out begins, you can convert it to a toddler bed and – wah-la- problem solved! There is also the space-saving element. As all parents know, kids come with stuff – stuff you need, stuff you don’t need, stuff your kid will outgrow before you even open the package. The more stuff you accumulate, the less space you have. A convertible crib isn’t as great as a second addition on your home, but it’ll at least provide some extra room by taking up less space. It eliminates the need to store multiple beds. Because it’s a crib, a toddler bed, a daybed and a full-size bed in one, your storage space won’t resemble a furniture store. Perhaps of most importance, a convertible crib removes the need for your child to adapt to new beds every time they have a growth spurt. Because the bed is a bed they “know”, they’ll be better able to sleep soundly without a learning curve. This convertible crib converts to toddler bed and daybed. It also offers four adjustable mattress levels and a non-toxic finish. It’s made of New Zealand pine wood. Parents like that this crib is very easy to assemble. The style, size, and affordable price are also perks. It’s ideal for people who live in apartments or small homes (or large homes with lots of stuff). This convertible crib offers four options with a gentle curve and classic design. It’s made to not only give your child sleeping solutions from infancy to adulthood, but to also act as an elegant centerpiece of your child’s bedroom. Parents like that this product is easy to assemble. It’s also heavy and made of high quality, sturdy wood. It’s cute and fits well in a nursery or child’s corner. And, it has options to adjust mattress height. Parents don’t like that some of the screws and bolts on the front and side of the crib are exposed (once it is fully assembled). Some others have described it as not a “high end” crib, but still good quality for the affordable price. This convertible crib offers four sleeping choices. It comes in grey, white, or dark chocolate colors and offers three mattress positions. Parents like that this crib is sturdy and elegant-looking. It’s solid and high quality with several options for growing kids. Parents don’t like the assembly. While some have said it was fairly easy to put together, many complaints are in regards to the instructions. They’re just graphics, which makes it more difficult for people who aren’t particularly visual learners. This convertible crib offers four options (including a multi-positional crib). It has a slightly curved headboard with airy slats and is JPMA certified. Parents like the look of this crib, describing it as “cute” and “awesome.” It’s easy to assemble (for most people) and sturdy and durable. The high quality makes it an alluring buy for the affordable price. Parents don’t like that the crib has paint that easily chips. It’s also shorter than advertised, which might or might not work for mom and dad (depending on their own heights and preferences). This convertible crib comes in five different finishes and offers four sleeping options. It is designed to provide a clear view of your child while maintaining a fashionable appearance. Parents like that this crib is a good size (big but not bulky). It’s sturdy, nice-looking, and affordable. Assembly is easy as well. Parents don’t like that it scratches easily (some report it scuffs easily too). It’s also covered in stickers that most people will want to remove. The simplicity is attractive to some parents while others want a little more flair. This convertible crib offers three different sleeping options. It features a stationary rail design for increased safety as well as teething rails, a dual hood, and safety locking wheels. Parents like that this crib is sturdy with easy to assemble instructions. It’s a space-saver and perfect for rooms that are small or cramped. It’s also simple and blends in with a variety of decor. Parents don’t like that assembly (while easy) often requires more than one person (though some people report doing it by themselves). Adjusting the spring base is also tiresome as it requires removing one side of the crib. And while it’s sturdy, it might not hold up if kids regularly use it as a trampoline. This convertible crib is designed to be the centerpiece of a nursery. It offers four sleeping options with plenty of modern touches (including x-shaped base and bold two-tone finish). It’s JPMA certified. Parents like that this crib is nice-looking and blends in well with a variety of decor. It’s very sturdy and works well even with repeated use (naps and bedtime). Parents don’t like that it’s not conducive to a crib skirt because of the shape. The paint also chips, a commonality for cribs. Convertible cribs aren’t for parents who want to buy a new bed every few years. But, if shopping aimlessly and spending unnecessary money aren’t two of your favorite hobbies, this type of crib is right up your alley. Buy once and be done until college.